HSBC Large and Mid Cap Equity Fund - Should You Invest? Up ahead of the Lok Sabha elections, HSBC Mutual Fund launches HSBC Large and Mid-Cap Equity Fund (HLMEF) an open-ended equity scheme that will invest predominantly in both large-cap and mid-cap stocks. As per SEBI's categorisation norms, an equity-oriented mutual fund scheme is characterised as a large & mid-cap one only if it invests at least 35% of its total corpus each in equity & equity related instruments of large-cap stocks and simultaneously maintains minimum 35% allocation to mid-cap stocks (i.e. companies from 101st to 250th on full market capitalisation basis). The remaining portion is parked in debt & money market instrument. HLMEF will follow the asset allocation limits to allocate its assets between 35% to 65% investment in equity & equity related instruments of large-cap and mid-cap companies each. The fund may also allocate utmost 30% of its assets to equities and equity-related securities of other than large cap and mid-cap companies with the remaining allocation to debt instruments and money market instruments. The fund house believes that the recent corrections in the large-cap space and mid-cap space provide a conducive opportunity to tap duality - stability of large-caps and high growth potential of mid-caps. 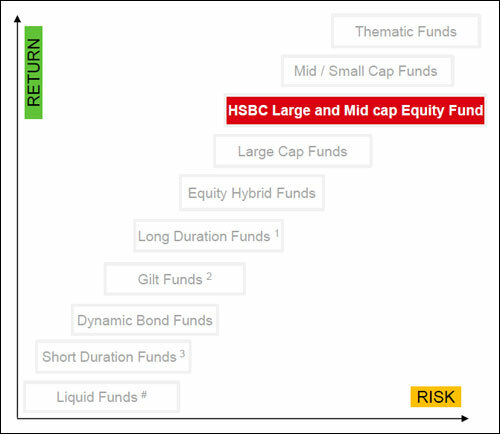 Hence by launching HSBC Large and Mid Cap Equity Fund, HSBC mutual fund offers a right mix of Large Caps and Mid Caps to deliver higher growth with lesser volatility. Being an equity scheme, HSBC Large and Mid Cap Equity fund has high risk. But it is placed below Mid, Small Cap and Thematic funds on the risk-return spectrum. Hence, it is considered to be the safest among equity funds after the large-cap funds. Thus, when you plan for long-term goals, want the stability of large-caps along with the agility of mid-caps in the journey of wealth creation and accomplishing financial goals and if you have the stomach for moderately high risk, you may skew your equity portfolio to a Large & Mid-cap fund. An open-ended equity scheme investing in both large-cap and mid-cap stocks. To seek long term capital growth through investments in both large cap and mid-cap stocks. However, there is no assurance that the investment objective of the Scheme will be achieved. Any redemption / switch-out of units within 1 year from the date of allotment shall be subject to 1% exit load. No Exit Load will be charged if units are redeemed / switched-out after 1 year from the date of allotment. Further, it is stated in the offer document that, if the Scheme decides to invest in securitised debt, it is the intention of the Investment Manager that such investments will not normally exceed 20% of the corpus of the Scheme and if the Scheme decides to invest in ADRs / GDRs issued by Indian Companies and foreign securities in line with SEBI stipulation, it is the intention of the Investment Manager that such investments will not, normally exceed 30% of the assets of the Scheme. The Scheme shall have derivative exposure as per the SEBI regulations issued from time to time. However, the Scheme does not intend to write call options under the covered call strategy. Further, derivatives exposure shall not exceed 50% of the net assets of the scheme. The aim of HSBC Large and Mid Cap Equity Fund is to seek duality of growth and deliver above benchmark returns by providing long-term capital growth from an actively managed portfolio, comprising primarily of large cap and mid-cap stocks. The Scheme aims to be predominantly invested in equity and equity-related securities. The Scheme will endeavour to achieve this by maintaining a minimum of 80% allocation to equity and equity-related securities out of which allocation of at least 35% each will be towards large cap stocks and mid-cap stocks. The Scheme will allocate the balance portion primarily towards all cap equity. The investment could also be made towards fixed income securities including money market instruments. To construct the portfolio, a top down and bottom up approach will be used to invest in equity and equity related instruments. Investments will be based on the Investment Team's analysis of business cycles, regulatory reforms, competitive advantage etc. Valuation and the key earnings drivers. HLMEF will maintain a diversified portfolio spread across various industries/sectors in order to mitigate concentration risk. As per the asset allocation pattern indicated above, for investment in debt securities and money market instruments, the Scheme may invest a part of its portfolio in various debt securities issued by corporates and/or state and central government. Such government securities may include securities which are supported by the ability to borrow from the treasury by or supported only by the sovereign guarantee or of the state government or supported by GOI/state government in some other way. The short as well as long-term financial health of the issuer. The AMC will also be guided by the ratings of rating agencies such as CRISIL, CARE and ICRA or any other rating agency as approved by the regulators. The Scheme may invest in other Scheme(s) managed by the AMC or in the schemes of any other mutual fund, provided it is in conformity with the investment objectives of the Scheme and in terms of the prevailing Regulations. As per the Regulations, no investment management fees will be charged for such investments. 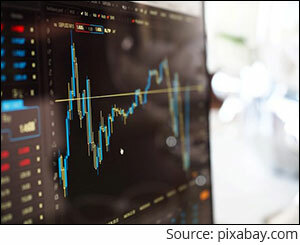 Since investing requires disciplined risk management, the AMC would incorporate adequate safeguards for controlling risks in the portfolio construction process. Risk will also be reduced through adequate diversification of the portfolio. The HSBC will be managed by Mr Neelotpal Sahai. Mr Neelotpal Sahai is the Senior Vice President & Fund Manager of Equities at HSBC Asset Management (India) Private Limited. He is associated with HSBC Asset Management from April 2013. He holds a B. Tech degree from IIT Varanasi and PGDM from IIM Kolkata. He has work experience of over 24 years in Research and Fund management. He worked as an Equity Analyst for 2 years with UTI Securities Ltd, then joined SBC Warburg as an Analyst for a period of one year. Further, he joined Vickers Ballas Securities Ltd for a year as an Analyst to later join Infosys Ltd as a Senior Project Manager for 6 years. Thereafter, joined Motilal Oswal Securities Ltd as a Senior Research Analyst for a year, followed by an opportunity to work as a Director in IDFC Asset Management Company Ltd for 7 years before joining HSBC Asset Management. Some of the other Equity schemes he manages are HSBC Large Cap Equity Fund, HSBC Multi-Cap Equity Fund, HSBC Small Cap Equity Fund and HSBC Equity Hybrid Fund. As can be seen, the HSBC Multi-Cap Equity scheme is the only scheme that has outperformed the Benchmark and the remaining schemes are in line with their respective indices. Hence, his management style can at best be termed as modest and does not give much confidence to investors. HSBC Large and Midcap fund is launched with the sole intent to capture the stability of Large Caps during volatility in markets and consistent growth of Large and mid-caps (future large caps) over a longer period. Earnings now need to justify, valuations as they aren't cheap. The trail P/E of the S&P BSE Sensex and the large-cap index is currently at 28x and 26x. Likewise, even the mid-cap space, after some correction, the P/E multiple has again moved up to 33x. Hence the fund house mentions in its product leaflet that in large-cap space there has been a concentration in performance and some of the large caps have corrected recently. 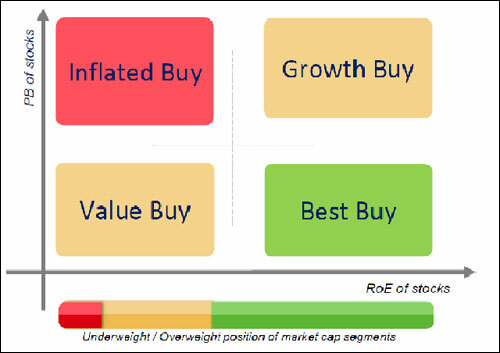 Besides the midcap segment continues to be more bottom up and the sharp correction of few mid-caps have opened some investment opportunities at reasonable valuations. Hence the performance of the HSBC Large and Mid-Cap Equity Fund relies on the construction of the portfolio. The fund manager will construct the portfolio using a blend of top down and bottom up approaches to investing in equities with the help of a proprietary "PBROE" stock selection and management model. However, amidst the extreme turbulence constructing the portfolio would not be easy and may inflict high-risk. Thus, investors need to invest cautiously without compromising on long-term growth. So, a Large and Mid-cap fund is suitable for the investors who are looking for stability and growth over the long term of more than 5 years can allocate some portion to HSBC Large and Mid-Cap scheme, provided if an investor is ready for moderately high risk. Editor's note: If you too want to retire blissfully and rich, don't miss out on PersonalFN's Retire Rich service. This is a new and exclusive service with the sole intent of securing your retirement. Equitymaster requests your view! Post a comment on "HSBC Large and Mid Cap Equity Fund - Should You Invest?". Click here!